Please Help Stop the Elimination of Sandias’ Few Remaining Bears. In the last three years approximately 140+ Sandia bears have been either killed or relocated to other mountain ranges…out of what was originally touted to be a population of 50-73 bears. The low reproduction rate of this vulnerable species cannot biologically sustain this high attrition. Only caring, proactive residents can stop the complete decimation of Sandia’s bear population. 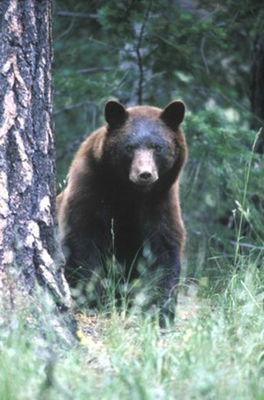 The Manzano bear population has also had much higher than usual kills and relocations. Plus, bear hunters can use dogs with telemetry and horses to hunt Manzano’s bears. Come spring, bears will be lower on the mountain (near homes) because warmer temps produce their first foods. They will then move higher up the mountain as warmer temps produce needed forage. Please make the effort to save a bear… Help stop the first ever shameful extinction of a small bear population in a New Mexico mountain range (the Sandias). As the drought continues, many natural springs have dried up. Please put water out for wildlife. Put water containers far away from your home and your neighbor’s homes. One Arizona study showed that keeping trash in a garage, shed or bear-proof can…and putting it out the morning of pickup would cut the chances of a bear visit from 70% to 2%. It’s an easy way to save a bear. Seeds are a natural food for bears. Letting your bird feeders turn into bear feeders teaches bears to return for more. Hang your seed-feeders and hummingbird feeders at least 10 feet high and 10 feet away from anything a bear can climb. Never store seeds outside. A 50-pound bag of sunflower seeds has over 87,000 calories---quite a reward for a bear, but with a potentially deadly habituation. For poultry and small livestock, build a sturdy shed surrounded by a 5-strand electric fence using an approved fence charger with alternating current. Be sure to check with the county inspector for guidelines and limitations. Beehives will require electric fencing for protection. Keep barbeque grills clean or stored inside. Keep cars food-free…a bear can do a lot of damage trying to access food in your car. If a bear is damaging swimming pool or hot tub covers, provide water far away from your house. Never use poisons. Poisons get into the food-chain and will kill a variety of wildlife. Keep first story windows/doors closed nights. Trapping/relocation doesn’t always work. For bears, it’s far from ‘happily ever after”. They can be killed by a dominant bear in the new territory. Bears will also be vulnerable to hunters since they are usually relocated to heavily hunted regions. Bears also use their homing sense to try to come back to their home territory. Returning bears are often killed by cars while crossing roads and interstates. Last year many of the bears trapped from the Sandias were killed with the rest being taken to unknown forage and water. It’s a vicious cycle…and one that only caring, proactive humans can break. If you see a bear near your home, yell at it and bang pans, etc. near the safety of a doorway; let the bear know it is not welcome. If a bear is in a nearby tree, take your dogs and yourself inside your home…give the bear time to leave. Face to face encounters with bears are rare. 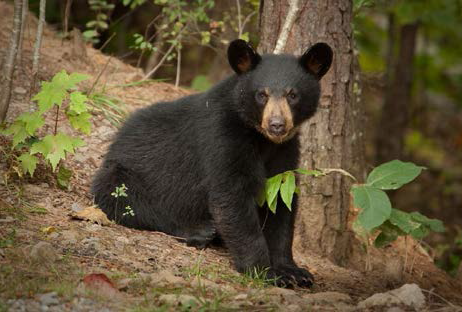 Black bears are not aggressive and will usually try to avoid humans. Don’t run…running may cause the bear to instinctually give chase. Stand and face the bear (don’t make eye contact) talk quietly and slowly back away. If cubs are nearby, try to not come between them and mother bear. If a bear gets into your house, open all doors you can safely access and leave. Bears are intelligent, resourceful and amazing! Black bears are naturally shy and very wary of people. Their normal response to any perceived danger is to run away. Over 90% of a bear’s natural diet is grasses, berries, fruits, plants and nuts (acorns). 10% is insects and scavenged carcasses. Bears are not naturally nocturnal, but frequently forage at night in hopes of avoiding humans. In 2011-2013, 2,269 bears in New Mexico were killed by hunters and depredation calls out of an unknown “guesstimated” of 5,000-7,000 bears. This did not include high natural die-off in drought years. NM’s female bears (sows) are 5-7 years old before they have their first cub. This is the slowest reproduction among all species in New Mexico. Even though bears are unusually good mothers, in NM, there is a 50% attrition of cubs in the first year. In New Mexico, most bears are active from mid-April through mid-November until their 5-6 month torpor (hibernation). Keep bear-spray with you when hiking or camping in bear country.